The Eagle Ford formation is a shale play that extends 400 miles from Mexico across to eastern Texas. The formation is found at depths from 4,000 – 12,000 ft and lies over the Buda limestone and under the Austin chalk. Although the formation is not naturally fractured, the rock is brittle, making it a good candidate for hydraulic fracturing. Within the Eagle Ford there are three production windows: dry gas, wet gas/condensate and crude oil. With rough estimates of 84 Tcf total gas in place and 3 – 4.8 billion bbl recoverable oil, operators are positioned throughout all of the windows attempting to capitalize on the potential. 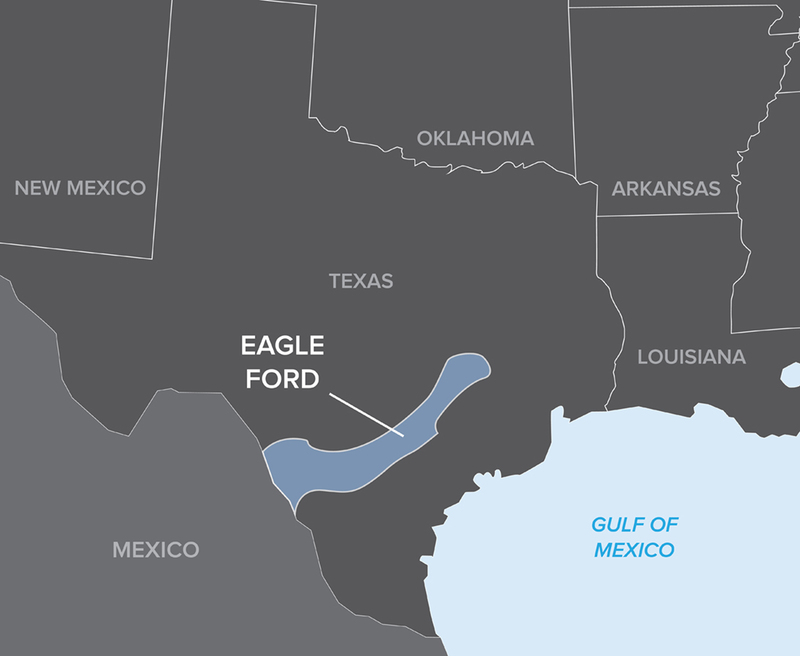 As development continues to ramp up and successful wells are cropping up throughout the play, the Eagle Ford is showing the potential of becoming one of the biggest plays in Texas. With an exponential increase in drilling permits in the Eagle Ford between 2008 and 2012 and a steady surge in 2013, it is clear the area will continue to undergo extensive development. As a result, operators throughout the play are looking for efficient drilling and completion strategies to ensure sustained success for their Eagle Ford developments. Operators must determine the best completion strategy to optimize the formation characteristics and deliver successful wells. Efficient solutions are needed to produce economic wells, allowing operators to take advantage of the Eagle Ford. An operator working in La Salle County, Texas between the crude oil and wet gas/condensate window of the Eagle Ford formation was focused on finding a completion solution that would deliver a successful well. The operator used a 26-stage Packers Plus StackFRAC® HD system to complete their well with a true vertical depth of 8,516 ft and a measured depth of 14,460 ft. The system was installed with an average stage spacing of 206 ft along a 5,525 ft lateral. By using Packers Plus open hole multi-stage fracturing technology, the operator was able to take advantage of the brittle rock of the Eagle Ford. In addition, a Packers Plus SF Cementor™ stage collar was used to cement the StackFRAC HD system through the build and vertical section up to surface. The well was successfully fractured two weeks following the installation. The total proppant pumped was 7.8 MMlb and slickwater fracture fluid was used with a maximum pump rate of 84 bpm. All of the stages were stimulated as designed and the operator was satisfied with the completion. The well was drilled 2,000 ft parallel to another well completed using cemented liner plug and perf by the same operator. The StackFRAC HD completed well produced over 78,000 BOE in the first 6 months compared to the offset, which produced over 50,000 BOE. The Packers Plus well made 35 percent more production in that 6 month time frame, which equated to $2.6MM at the price of Eagle Ford crude during that time. In addition, the operator saved $500,000 in fracture stimulation costs versus the offset and estimates that $100,000 can be saved on a future well using Packers Plus completion technology. More opportunities in the formation are allowing Packers Plus to further demonstrate the ability to deliver efficient and economic wells.